Macron has enjoyed a smooth start in the five weeks since he beat far-right candidate Marine Le Pen. 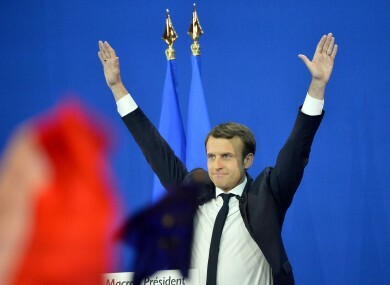 FRENCH PRESIDENT EMMANUEL Macron’s party topped the first round of voting in today’s parliamentary elections, putting him on course for an overwhelming majority to implement his programme of ambitious reforms. Estimates based on partial results showed Macron’s year-old Republique en Marche (Republic on the Move, REM) and its ally MoDem on 32.2-32.9%, ahead of the right-wing Republicans on 20.9-21.5%. The far-right National Front (FN) was seen third with 13.1-14%. Seat projections showed Macron’s camp going on to win between 390 and 445 seats in the 577-member National Assembly after next Sunday’s second round – continuing his centrist revolution which has left France’s traditional parties in tatters. Both the Republicans – who had hoped to upstage Macron in the parliamentary election — and the Socialists of Macron’s predecessor Francois Hollande appeared set for steep losses. Marine Le Pen’s FN party was left disappointed as she struggles to rebound from her bruising defeat by Macron in the presidential run-off, with the party’s result largely unchanged from the first round of the 2012 vote. Turnout was markedly down on Sunday compared with the last parliamentary election, reflecting a degree of fatalism among Macron’s opponents in the face of his advance as well as a degree of election fatigue, experts said. Around 49% of the electorate cast a ballot – one of the lowest levels in such an election in decades. The results showed Macron continuing to impress the French, a month after being elected France’s youngest-ever president on 7 May. Since then he has won praise for appointing a balanced cabinet that straddles the left-right divide and taking a leading role in Europe’s fight-back against US President Donald Trump’s decision to withdraw from a global climate accord. If the seat projections are confirmed next week he will have a strong mandate to push through the ambitious labour, economic and social reforms he promised on the campaign trail. Few MPs are expected to be elected outright today. If no candidate wins over 50%, the two top-placed contenders go into the second round — along with any other candidate who garners at least 12.5 percent of registered voters. More than 50,000 police were on patrol during the vote, with France still jittery after a wave of jihadist attacks across Europe. Email “French elections: Macron on the way to overwhelming majority”. Feedback on “French elections: Macron on the way to overwhelming majority”.